Interest rate versus APR, what is the difference? A lot of people who are thinking of getting a loan do not really understand the difference between them. While these terms have been easily misunderstood, and the number of credit card debt continues to increase, it is important now more than ever to understand the difference as it can save you a lot of money. While they are similar, because they both describe how much you’ll pay at the end, they are ultimately not the same. Let’s now cut to the chase in knowing how APR vs interest rate differs. When you take out a loan, the lender charges you, the borrower, an interest rate which indicates the cost of borrowing the money. In order words, you’ll be charged a variable or fixed percentage for borrowing a certain amount of money. Accrued interest rate payments are calculated by multiplying the annual percentage rate by the total outstanding balance of the loan. For example, if you were to take out a mortgage loan for $500,000 with a 6% interest rate; your annual interest rate would be $30,000, or a monthly payment of $2500. You can see from this example, that your interest rate and the duration of your repayment determine your monthly refunds. Nevertheless, the interest rate and monthly payment alone cannot give you the complete details of how much your loan will cost to repay since it does not include other upfront or recurring loan fees that you may be charged, and that is where APR comes in. 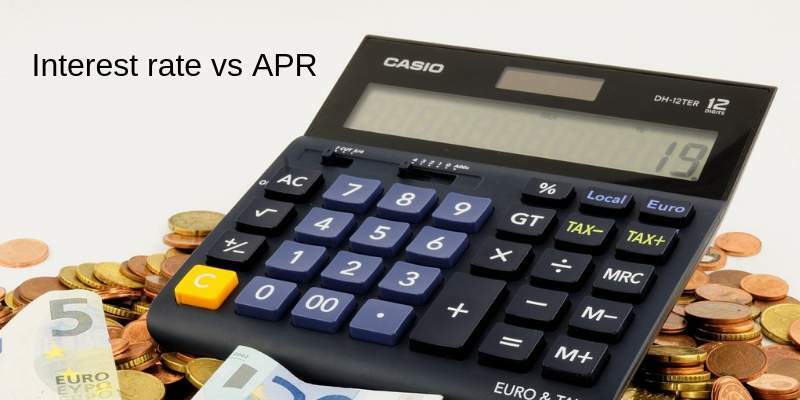 APR is an abbreviation for “Annual Percentage Rate”, this encompasses both the interest rate payments as well as other fees charged for a loan, which can include origination fees, closing cost, documentation fees, and other services charges. In other words, APR gives you a comprehensive and accurate representation of the total cost of the loan obtained. APR is especially useful for mortgage and credit card loans. APR is calculated by multiplying the interest rate by 12, the number of months in a year in which the periodic rate is applied. What do we mean? Consider this example; a lender gives $100,000 to a borrower with a 7 percent interest rate using a 30-year fixed mortgage rate. The borrower is then required to pay back $1000 in the closing cost or a monthly payment of $665.30. So the annual percentage rate will amount to 7.0999. It is noteworthy, that lenders are required under the Truth in Lending Act to disclose all additional fees and expenses associated with the loan so as to protect borrowers against inaccurate and unfair practices. Having said that, what is the difference between a mortgage rate vs APR? This is another important thing you’ll need to understand when shopping for a mortgage. You will not end up paying more money than what is necessary if you fully understand the difference between mortgage rate vs APR. A mortgage rate includes a small percentage that is added to the borrower’s loan balance to determine the amount of interest to pay his lender every month. When the borrower starts repaying the loan, his rate will be used in calculating the interest portion of his monthly refunds. What do we mean? For example, if the borrower owes $100,000 and his interest rate is 5%, the yearly interest payment will amount to $5,000, and he will be expected to pay a percentage of that amount each month as part of his mortgage payment. It is worthy of note, that monthly payment is never calculated with an annual percentage rate. So how is it different from the APR that we’ve earlier defined? The basic difference between APR and mortgage rate is that the former is always expressed as a broader cost of borrowing which includes the broker fees, discount points, closing costs etc, while the latter is expressed in a percentage. Put simply, if you’re a borrower who is concerned about his monthly payment, your focus should be on the mortgage rate because it determines your monthly payment. On the other hand, if your worry is about the total cost of the mortgage, your attention should then be focused on APR. Another important factor you need to consider while looking at the mortgage rate vs APR is the time frame. If you plan on staying in a newly purchased home for a long period of time, say 30 years, it would be reasonable to go for the lowest APR possible. On the other hand, if you’re considering taking a home loan just for a limited time period, then it’s advisable not to pay any upfront cost and also go for the higher interest rate and also a higher APR. So if you need a mortgage for your first home or for an investment property, you can find the best mortgage brokers that can offer you their lowest interest rates on this website.